Due to its healthful aspects — high in protein, vitamin B-12 and iron — fish is something I try to eat at least twice a week. It can enliven a boring week of chicken, pork and beef. But it can be challenging to find super fresh fillets that don’t sport the stomach-turning “fishy” taste; frozen is often what I reach for. But you can still find excellent fresh fish at the grocery store and fish counters, however, you must be vigilant — always ask the guy behind the counter to let you smell the fish before it’s wrapped. Even a whiff of fishiness is a good indication it’s been out of the water a while. Your nose will let you know the deal. This quick weeknight fish recipe calls for either sea bass or Mahi Mahi, but you can use other white fish as well (halibut or cod come to mind). Tilapia isn’t ideal since it’s too thin, and oilier fish like salmon or swordfish won’t work either. You can also half this recipe. To keep the fillets crispy for the next day, store in a plastic container with wax paper on the bottom. This recipe is outstanding served with a heavier bodied white wine like unoaked Chardonnay or Chenin Blanc. 1. Preheat broiler. Spray broiler pan with cooking spray. 2. Assemble sauce: Combine all ingredients in a small bowl. Mix well. 3. Place egg whites in a shallow dish. 4. 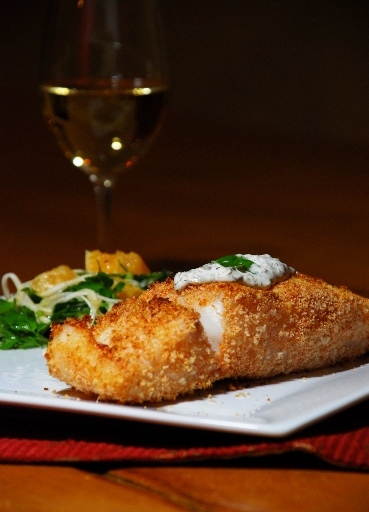 Combine panko and spices in a shallow dish. 5. Make sure fish is free of excess water by blotting with a paper towel. Sprinkle fish evenly with salt and pepper. Dip each fillet in the egg white, then dredge in panko mixture. Place each filet on broiler pan. 6. Broil 4 minutes each side or until desired degree of doneness. This will vary based on the thickness of the fillets. And make sure your pan isn’t too close to the broiler or it might burn — adjust the height level as needed and don’t walk away from it.